Huawei has recently unveiled a flagship smartphone, the Huawei Honor 8 Pro but that was not the only thing as it showed up with a mid-range phone as well. The Huawei Honor 6C was also unveiled recently and will be available only in Europe for now. 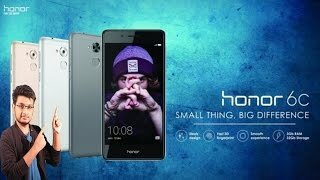 To find out more about this upcoming phone including the Huawei Honor 6C Nigeria price and specs, keep reading. For those who are familiar with the Huawei Honor 6, you already know what to expect when it comes to the screen size. It’s a 5-inch screen showing 720p resolution with 2.5D curved glass. The front looks quite simple while the back side will remind you some of the recently released phones from Huawei like the Huawei Honor 5X and Huawei P9. It’s definitely not one of the best looking phones out there but it’s quite good for a budget phone with the metallic design. The phone will be available in three different colors including gold and silver which is something to look out for after the Huawei Honor 6C release date Nigeria. Surprisingly, this phone will be running Android Marshmallow 6.0 operating system instead of the latest Android Nougat 7.0 which is quite disappointing. To make sure users get to capture their precious moments, there is a 16-megapixel rear camera on the back and a 5-megapixel selfie camera. The rear camera is capable of 1080p videos and we will be able to find out more about how the camera performs in real life after the Huawei Honor 6C release date Nigeria. While there are other better camera focused phone in the market in the same pricing range, it will get the job done if you don’t rely on your mobile camera mostly to take pictures. There is the Huawei Honor 6X and OnePlus 3T that you can check out which are two great mid-range camera focused phones available in the market. Moreover, these are also in the same price range as the Huawei Honor 6C Nigeria price. Under the hood, the Huawei Honor 6C is packing a Qualcomm Snapdragon 435 quad-core processor clocked at 1.4GHz. This processor has been paired with 3GB of RAM and the phone comes with 32GB built-in storage. There is a microSD card slot as well but it’s not a dedicated slot and can be used as a SIM slot as well. Another great feature of this phone is its battery which is a good 3020mAh one. As the specs are not too heavy, it should easily last a day if not more. There is also a fingerprint scanner which is nice to have in a budget phone. The Huawei Honor 6C is expected to cost about 98400 ₦ when it’s here. As mentioned earlier, it will be available in limited places for now in Europe at the end of April, 2017. The honor 6c Mobile Phone is manufactured by Huawei and was added around April 2017 and is part of the Huawei Honor 6C series. 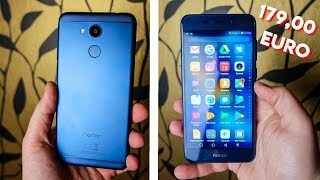 Huawei Honor 6c | Snapdragon Processor and 720p screen Why ????? ?